The PreOrder has been really fun, everyone is happy with their orders and deliveries will be the end July/early August when the Spring/Summer 15 range is officially launched. Monday is the last day but we are fully booked and the range has to be be returned to NZ on Tuesday so we can't extend due to popular demand. If you want to get in on the ground floor for the next one, make a note in your diary for the next Pre Order for Autumn/Winter 2016 approx end November/early December. 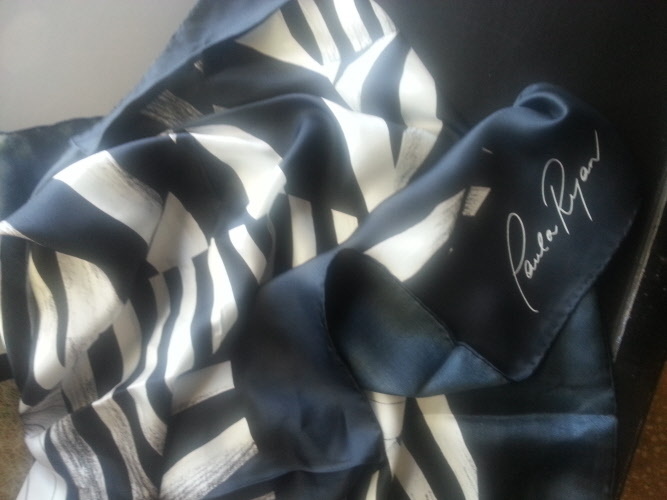 Paula has created a monogrammed silk scarf (110 x 110) in her signature black and white - the scarf has hand rolled edging and will retail for $130.00 - see image at top right. Available August when range released.